Immunization (or immunisation in British English) is the process of conferring increased resistance to an infectious disease by a means other than experiencing the natural infection. Typically, this involves exposure to an agent (antigen or immunogen) that is designed to fortify the person's immune system against that agent or similar infectious agents (active immunization). Immunization also can include providing the subject with protective antibodies developed by someone else or another organism (passive immunization). When the human immune system is exposed to a disease once, it can develop the ability to quickly respond to a subsequent infection. Therefore, by exposing an individual to an immunogen in a controlled way, the person's body will then be able to protect itself from infection later on in life. The term immunization often is used interchangeably with vaccination and inoculation, all of which use a viable infecting agent. Like active immunization, vaccination involves administration of antigenic material to produce immunity to a disease, which will prevent or ameliorate the effects of infection by a pathogen. This material can either be live, but weakened forms of pathogens (such as bacteria or viruses); killed or inactivated forms of these pathogens; or purified material such as proteins. While vaccination is used today in the same sense as immunization, in a strict sense the term refers to its original meaning, which is protection conferred against smallpox by material taken from cow infected with Cowpox virus, which is related to the vaccinia virus (Blakemore and Jennett 2001). While in common use, the term inoculation can be used synonymously for immunization, it is often limited to a process involving unweakened, live pathogens. The term inoculation is used less frequently nowadays (Blakemore and Jennett 2001). Medical researchers have developed diverse immunization processes for a vast number of diseases, beginning on a large scale about a century ago. 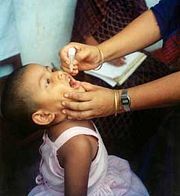 Immunization has proved to be one of the most cost-effective public health measures available (Breslow 2002), with vaccines providing the means for eradicating smallpox and bringing into sight the goal of making the world free from polio, measles, and other serious diseases. However, mastery of the agents causing human disease can be a two-edged sword as that mastery can also be applied toward developing biological weapons that cause diseases. Even now there remains the fear that smallpox could be used as such a weapon, now that it has been eradicated and people are no longer being immunized. Recognizing that an infectious disease, once overcome, did not normally reappear, people have tried to prevent getting a disease by purposely inoculating themselves with infected material. This is first known with smallpox before 200 B.C.E. (NMAH 2007). In 1718, Lady Mary Wortley Montague reported that the Turks have a habit of deliberately inoculating themselves with fluid taken from mild cases of smallpox and she inoculated her own children (Behbehani 1983). In 1796, Edward Jenner (1749-1823) inoculated against smallpox using cowpox (a mild relative of the deadly smallpox virus). While Edward Jenner has been recognized as the first doctor to give sophisticated immunization, it was British dairy farmer Benjamin Jestey who noticed that "milkmaids" did not become infected with smallpox, or displayed a milder form. Jestey took the pus from an infected cow's udder and inoculated his wife and children with cowpox, in order to artificially induce immunity to smallpox during the epidemic of 1774, thereby making them immune to smallpox. Twenty-two years later, by injecting a human with the cowpox virus (which was harmless to humans), Jenner swiftly found that the immunized human was then also immune to smallpox. The process spread quickly, and the use of cowpox immunization and later the vaccinia virus (of the same family as the cowpox virus and the smallpox virus or Variola) led to the almost total eradication of smallpox in modern human society. After successful vaccination campaigns throughout the nineteenth and twentieth centuries, the World Health Organization (WHO) certified the eradication of smallpox in 1979. Vaccination to prevent smallpox was soon practiced all over the world. During the 19th century, the cowpox virus used for smallpox vaccination was replaced by vaccinia virus. Vaccinia is in the same family as cowpox and variola but is genetically distinct from both. Louis Pasteur developed a fowl cholera vaccine in 1880, was involved in the introduction of anthrax vaccine in 1881, and developed a rabies vaccine in 1885. In 1898, Almoth Wright developed typhoid vaccine, and in 1954 Salk (killed) polio vaccine was introduced, while in 1957 Sabin (live) polio vaccine was introduced. In 1960, measles vaccine was introduced, and later vaccines were developed for rubella, mumps, and hepatitis B. Passive immunization is where pre-made antibodies developed by one organism are given to another organism. This may involve administration of antibodies from one individual organism to another, such as the transfer of human immunoglobulin from one human to another or transfer of antisera prepared in animals. Passive immunity also includes the natural transfer of antibodies developed by a mother to her child across the placenta during pregnancy, helping to protect the child before and shortly after birth (Breslow 2002). This passive method of immunization begins to work very quickly, but it is temporary and generally short-lasting, because the antibodies are naturally broken down, and not stored for later use. It can also result in serum sickness and anaphylaxis. Artificial passive immunization is normally given by injection and is used if there has been a recent outbreak of a particular disease or as an emergency treatment to poisons from insects, and so forth. For example, special risk groups likely to suffer from complications of infection, such as with HIV, asthma, or congenital heart disease, may received passive immunization, as can individuals traveling to a country with high incidences of the disease. Active immunization involves stimulating the individual's own immune system by the administration of an antigenic substance into a person then the recipient will develop antibodies. This may involve introduction of an inactivated (killed) agent or an attenuated (live, but enfeebled) agent (Blakemore and Jennett 2001). The inactivated agents may involve killed whole organisms, sub-units of the killed organisms, or the inactivated toxins released by the organisms (Blakemore and Jennett 2001). Toxoids are made by using the toxins excreted by microorganisms and inactivating them chemically or physically (Breslow 2002). Attenuated agents may involve modified strains of the causal organisms (such as ones containing the genetic markers to stimulate antibody production but not the genetic components to produce the infection) or may involve related organisms (Blakemore and Jennett 2001). Examples of attenuated (live) vaccines include those for yellow fever, poliomyelitis (Sabin), measles, rubella, mumps, and rabies (Blakemore and Jennett 2001). Examples of inactivated (killed) toxoids include influenza, poliomyelitis (Salk), hepatitis A, and hepatitis B (Blakemore and Jennett 2001). The most commonly used toxoids are diphtheria and tetanus (Breslow 2002). Normally, protection from active immunization lasts for years or even confers lifetime immunity (Breslow 2002). Some vaccines, such as for diphtheria and tetanus, require periodic booster doses to maintain immunity (Breslow 2002). Ideally, vaccines should yield long-lasting protection, be inexpensive, have no adverse effect on the recipient, and be stable for transportation and storage (Blakemore and Jennett 2001). In the United States, each state provides school districts with an obligation to regulate those eligible to enter public schooling. Since schools are congregate settings, and thus communication of diseases is a consideration, school districts may exclude children who seek to attend without the protection of certain immunizations. For example, in the state of Ohio, each student is required to provide proof of specific immunizations or have an authorized waiver from the requirement upon entry to school at age six. If a student does not have the necessary immunizations or a waiver acceptable to the state, the school principal may refuse entry and require compliance with a set deadline. This procedure is for the safety of all students and the public health and follows Ohio State law. DPT (Diphtheria, pertussis, tetanus)—Five doses if the fourth one was before the fourth birthday. Measles—Two doses, the first one after 12 months of age, and the second at least 28 days after the first birthday. Polio—Four doses if the third was before the fourth birthday. Hepatitis B—For students starting kindergarten. Additionally, for schools offering a pre-school program, add the requirements for two doses of haemophilus influenzae. Behbehani, A. M. 1983. The smallpox story: Life and death of an old disease. Microbiol Rev 47(4): 455-509. PMID 6319980. Blakemore, C., and S. Jennett. 2001. The Oxford Companion to the Body. New York: Oxford University Press. ISBN 019852403X. Breslow, L. 2002. Encyclopedia of Public Health. New York: Macmillan Reference USA/Gale Group Thomson Learning. ISBN 0028658884. National Museum of American History (NMAH). 2007. History of vaccines. Smithsonian National Museum of American History. Retrieved September 18, 2007. Centers for Disease Control National Immunization Program . This page was last modified on 26 February 2018, at 00:37.